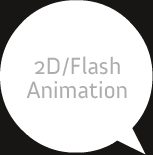 Flash has revolutionized the way we look at animation today. The very best of animation productions are being done on this platform. All forms of storytelling, movies, short films or episodes are finding their way in flash animation. And to make things really interesting live action can be coupled easily with flash animations to create a rich visual experience. While the creation of animation using Flash can be easier and less expensive than traditional animation techniques, the amount of time, money, and skill required to produce a project using the software depends on the chosen content and style.